Senior infielderJake Willsey readies a pass to freshman outfielder Kobi Owen during a practice before their opening weekend. Willsey started all three games for the Wave, finishing with one hit and two stolen bases overall. 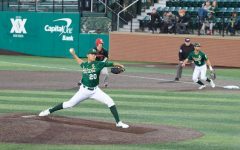 After Friday night’s storms delayed the Green Wave’s season opener at Greer Field at Turchin Stadium until Saturday, the Travis Jewett era began. 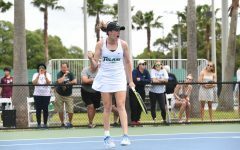 Tulane (1-3, 0-0 American Athletic Conference) split a doubleheader against Air Force (2-2, 0-1 Mountain West Conference) on Saturday, winning the first game 4-3 and losing the second 3-2. 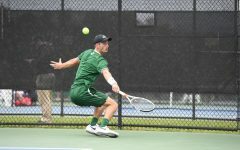 On Sunday, the Green Wave lost 7-4 to Army (1-3, 0-0 Patriot League). The first game of Saturday’s doubleheader began with a bang when sophomore outfielder Grant Witherspoon hit a solo home run to right-center field, giving the Green Wave an early 1-0 lead. The Falcons responded with a home run of their own by junior shortstop Tyler Zabojnik in the top of the second inning. 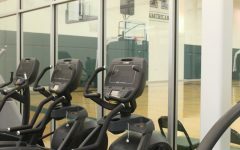 Tulane’s other runs came from freshman shortstop Sal Gozzo, whose second-inning single drove in senior outfielder Jarret DeHart. DeHart himself finished the game with two runs batted in, including a solo home run into right center field. Senior starting pitcher Corey Merrill allowed three earned runs and struck out four batters over seven innings. 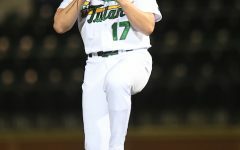 Graduate transfer pitcher Ted Andrews earned the save, allowing no hits and striking out one as the Green Wave rolled to a 4-3 win. 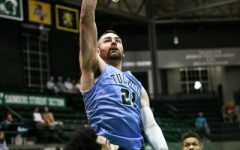 Tulane started strong in the second game of the doubleheader after senior first baseman Hunter Williams scored on a single by redshirt senior catcher Jeremy Montalbano in the second inning. 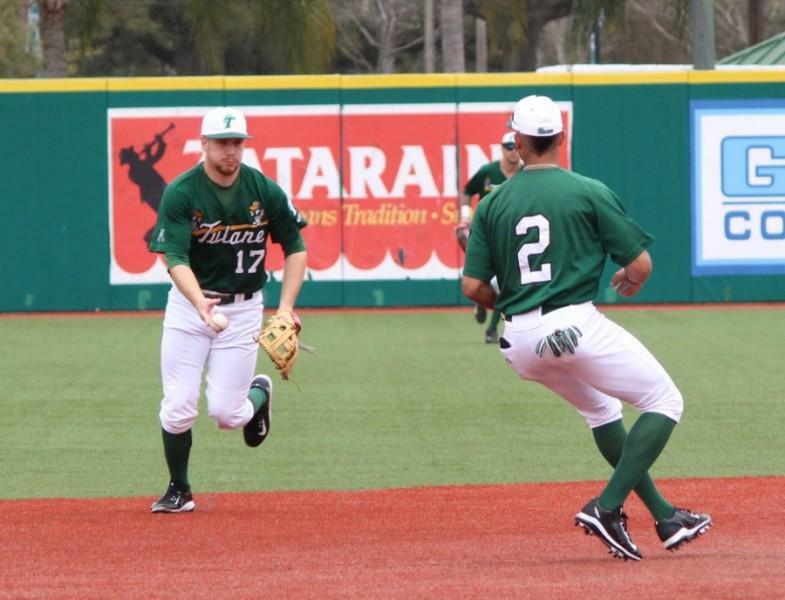 In only his second game back after offseason Tommy John surgery, Montalbano accounted for both of Tulane’s runs. Air Force was scoreless until the seventh inning when senior first baseman Bradley Haslam hit a solo home run to left field, followed by a single by sophomore catcher Rob Dau that scored the tying run. 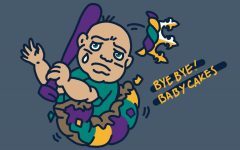 Later in the eighth, senior outfielder Tyler Jones reached home plate on a fielding error, making the score 3-2. The Green Wave was unable to recover. Tulane’s starting pitcher for the second game of the day, J.P. France, pitched seven innings, allowing six hits and striking out seven. Air Force starting sophomore pitcher Matt Hargreaves pitched all nine innings, allowing seven hits and striking out 10. 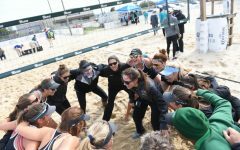 In its third game in just over 24 hours, Tulane started its game against Army with DeHart and Williams each singling in the first, scoring senior outfielder Lex Kaplan and DeHart, respectively, to tie the game at 2-2. Until the eighth inning, Tulane had three hits and zero runs while Army had four hits and scored five runs. Senior designated hitter Alex Dickerson was essential to the Black Knights’ success as he accounted for all seven RBIs and went 3-for-4 at the plate with a single and two doubles for Army. The Green Wave look to bounce back this weekend on Feb. 24-26 as the team travels to the West Coast to face California-Santa Barbara for a three-game series at Caesar Uyesaka Stadium.